Rabota.bg is an interactive site for job offers. Extremely quick and easy orientation, Rabota.bg can be used as an online organizer of supply/demand for work. 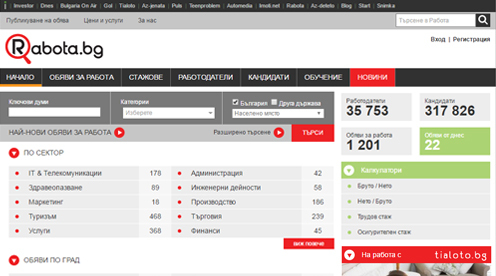 VIP offers in the site are broadcasted on other sites of Investor.BG as well. This significantly increases the chances the offer to be noticed by non-active job seeking professionals. The monthly newsletter of Rabota.bg has more than 150,000 subscribers.